New beginning lets see what happens next. Well its the fourth day back at work if you can really call it work. 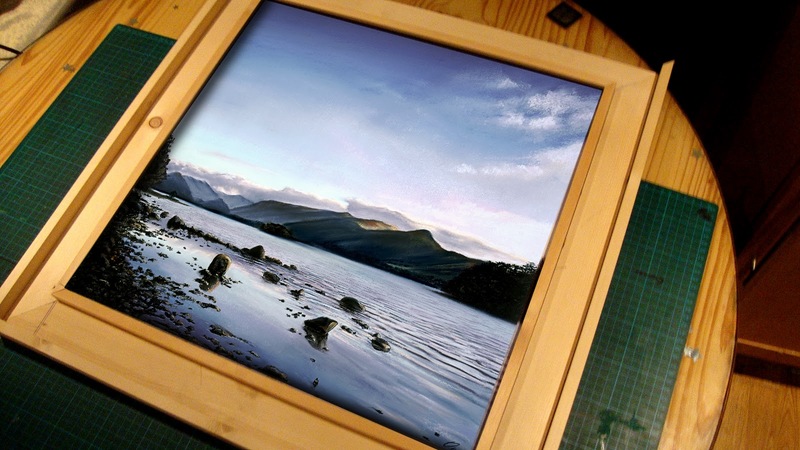 I've been experimenting with new ideas for presenting my canvas work without spending a fortune, today I started to create a new frame idea and I'm really pleased with it. It all came about because I have an exhibition next week and I don't want the work to cost to much to create. If it costs me say £120 for custom framing and £45 for the print I would need to sell them for £600 if the gallery was taking 50%, to keep it viable as a product creating all elements it can be done for a fraction of that and so sell at a price that the market can stand. I used a mitre saw but other than that all hand made and will retail at £250 in a handmade frame, limited edition canvas print. As i mentioned in a previous post you sometimes need to think outside the box and step back and look at a problem. As a result of this it will open all kinds future possibilities and to be honest I will enjoy creating the frames that show my work at its best. Still no drawing and painting yet but as soon as this job is done I'm going to be back on it. I love this frame. Would you consider publishing how you made it? All of us artists are in the same boat when trying to keep the costs down. Thanks! Your work is beautiful! Not a bad idea I will try to do that soon. Beautiful frame, i would really love to know how you came up with the design and the entire thing, i request for few directives on how to make it. My Apologies everyone visiting this site I'm currently updating it and adding better content. This also means I'm editing and deleting old posts, some of which you can still view on page links. This will take me a bit of time but once finished will give you a better understanding of the Company and myself. Starting on the 1st of October to the 31st of October 2016 Stephen Ormerod will be exhibiting alongside a wide selection of Northern artists. This is another chance to see the full selection of his work in this wonderful gallery as well as over fifteen very talented local artists. Padiham town hall are proud to announce that they are supporting Padiham's 'Plein Air' painting competition for the third year. Last year Painting Padiham was a huge success and this year we hope to exceed on applicants and visitors. Picture House Gallery are hosting the event, which takes places Saturday 11th May 2019. The Town Hall will be the starting point for the event and hub for visitors and artists to gain information on the day. The event begins at 8.00 am and finishes at 18.00 pm with all artists works handed in. Applicants must apply by the end of April 2019 to partake in the event. Artists will chose a place in the town to create paintings and drawings through out the day these will then be judged upon by a panel of professional artists. Cash prizes are awarded for 1st, 2nd and 3rd, plus a painting will also be chosen by the public to be on display in a exhibition space at Picture House Gallery for a month after the event.